Description: "Deeply moving. "—LOS ANGELES TIMES BOOK REVIEW? "Lavishly drawn, and devastating…. Vaughan has his marvelously imagined characters debate the concept of freedom versus desire for safety…the total effect is memorable. "—PUBLISHERS WEEKLY, starred? "This is an important work, strongly recommended for all adult collections. "—LIBRARY JOURNAL, starred "Seems destined to cement the reputation of Brian K. Vaughan as one of the best writers to grace the medium in many years. "—VARIETYThe startlingly original look at life on the streets of Baghdad during the Iraq War inspired by true events arrives in a stunning new softcover edition. In his award-winning work on Y: THE LAST MAN and EX MACHINA (one of Entertainment Weekly's 2005 Ten Best Fiction titles), writer Brian K. Vaughan has displayed an understanding of both the cost of survival and the political nuances of the modern world. Now, in this provocative graphic novel, Vaughan examines life on the streets of war-torn Iraq. The experience is made all the more evocative by the lush, spectacular artwork of Niko Henrichon.In the spring of 2003, a pride of lions escaped from the Baghdad Zoo during an American bombing raid. Lost and confused, hungry but finally free, the four lions roamed the decimated streets of Baghdad in a desperate struggle for their lives. 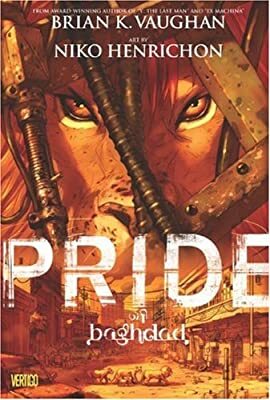 In documenting the plight of the lions, PRIDE OF BAGHDAD raises questions about the true meaning of liberation - can it be given, or is it earned only through self-determination and sacrifice? And in the end, is it truly better to die free than to live life in captivity?